The fresh look-around, which debuted in late May, visits "areas of the house never-before open to the public." The fresh look-around, which debuted in late May, visits "areas of the house never-before open to the public." It's the first new tour at the San Jose landmark in over two decades. 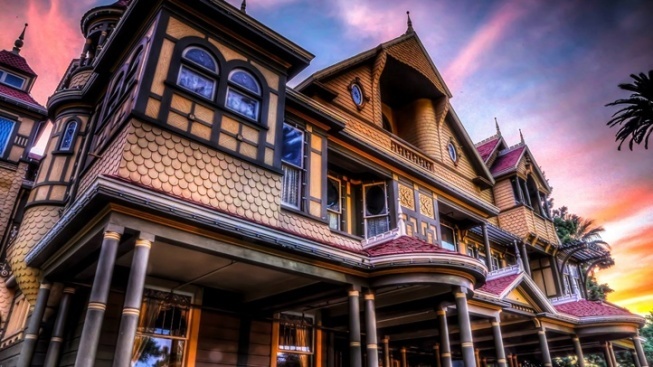 IN YOUR IMAGINATIVE MIND, the Winchester Mystery House is as big as a city, even if you've been to the Winchester Mystery House in San Jose, or you've seen it on a cable show, or you read about it in a book about the supernatural. For so much lore swirls around its wending hallways and doors to nowhere and the former lady of the mansion herself, Sarah Winchester, that it can be hard to fathom that it is an abode that isn't, in fact, endless. There are distinct spots where the exterior walls come to a close, or a turn, on the property, though, admittedly, the historical gem is ginormous, flat-out gargantuan, end of story. Which means this: There's probably stuff inside you haven't seen, even if you've personally been winsome over the Winchester for most of your life. Front-and-centering fans with some of those rarely seen corners of the rambling manse is what the recently started Explore More tour does, a walk-around that just happens to be the "...first all-new tour to be offered at Winchester Mystery House in more than 20 years..."
WHAT'S ON IT? Count on spying "areas of the house never-before open to the public," and count on a top-to-bottom visit, from the earthiest reaches of the mansion to the rooftops. And will there be some history woven through? You can count on it, since the Explore More tour "is presented in combination with the Mansion Tour," which delves into the life of Sarah Winchester and how all of those rooms for all of those spirits first came into being. One final question from the phantomists out there might be whether the spaces that are seen on the tour are finished or not. There are "unfinished" areas of the house to be viewed, which lends a time-folding, no-decades-have-gone-by feel to the adventure. Need even more adventure, beyond rooftops and unfinished spaces? Hold on tight: The Halloween season candlelight tours are just ahead.